When Emily’s marriage falls apart, she doesn’t cry, and she doesn’t rage. In fact, her best friend is a bit worried about the degree to which she is repressing her feelings and Emily quite clearly isn’t actually dealing with her divorce. As a novelist – and a stalled one at that – there is no 9 to 5 job where Emily must clock in, so she finally decides to visit her Great Aunt Bee on Bainbridge Island in Washington for a change of scenery. While there, she runs into an old boyfriend from her youth summering on the island, as well as a slightly mysterious yet handsome neighbor. Even more compelling to Emily than the men she meets, though, is the red journal she finds in the room she is staying in. Did Aunt Bee try her hand at fiction, or is this really the diary of a woman named Esther? And, if so, what happened to her, and what does any of this have to do with the unhealed schism between Aunt Bee and Emily’s mother? 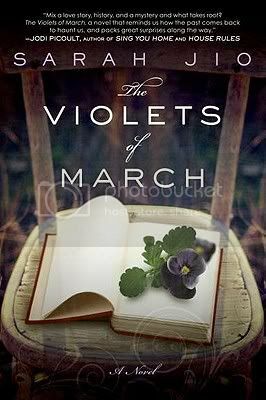 The Violets of March was simply a lovely book. Jio clearly loves her characters dearly, and her fondness for them makes them irresistible to the reader. This may sound like a setup with the potential to be saccharine, but Jio has a great sense of balance and narrative that prevents her story from turning campy or emotionally manipulative, while allowing it to be genuinely moving. Both Emily’s modern story and the mystery of the diary were well drawn, and Jio did a masterful job weaving them together in a way that detracted from neither story. This was a beautiful and well-written story of redemption, hope, and starting over. I can’t wait to see what Jio has for us next. Highly recommended. I absolutely adored this book. Great review. Could you help me with the family tree?? how is Bee her great aunt? Definitely a lovely read — and one that has stuck with me! I really enjoyed the contrast of Emily’s story with that of the diary’s narrator and was sad when it ended. I really do want to read this one. I’m going to have to get it very soon. Oh, you would love it, you must read it! I was just having a conversation the other day about how I always seem drawn to books that have a story within a story – and of course reading this review I’m thinking “that sounds really good!” I guess maybe it’s my type of book! If you like that kind of book you should definitely check this out, and it is a paperback original, so not too expensive to try! Interesting to read this as a contrast to Julie, who didn’t really love it. But that is why we write reviews and express opinions. It sounds like it could have been hokey…they always have to meet up with an old flame! Glad the author took it to a better place. Oh this sounds delightful! I’ve seen reviews all across the board on this one but I think that I’m siding or at least throwing in my bet with the positive ones, for now. Might have to check it out!